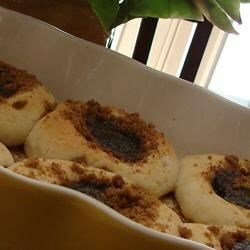 "This is a Czech Pastry my Grandma use to make with a homemade prune filling and streusel topping. I changed it a little so I could use the bread machine. They are worth the hard work!" Place the warm water, salt, egg and 2 tablespoons butter in the pan of a bread machine. Add bread flour, and pour 1/4 cup sugar on the edge of the pan. Make a shallow hole in the flour and add the yeast. Close the lid, and set machine for the DOUGH cycle. While the dough is mixing, combine the prunes, prune juice, 1/4 cup sugar, cinnamon, cloves and lime juice in a saucepan. Bring to a boil, then reduce heat to low, and simmer until prunes are soft and the sauce has thickened, about 15 minutes. Remove from heat and blend in a mixer or food processor until smooth. When the bread machine signals the end of the dough cycle, transfer the dough to a lightly floured surface. Divide the dough into 20 small egg-sized pieces. Cover with greased plastic wrap, and set aside for 10 minutes. In a small bowl, mix together 1 cup sugar and 1/2 cup flour. Stir in melted butter and 1 teaspoon cinnamon to make a crumbly streusel. Preheat the oven to 350 degrees F (175 degrees C). Grease a large baking sheet or line it with parchment paper. Shape the kolache dough into balls and place them on the prepared baking sheet. Press a shallow hole in the center of each one, and fill with prune filling. Top each of the kolaches with streusel. Let the kolaches rest until doubled in size, about 20 minutes. Bake until the tops are lightly browned, 14 to 16 minutes. You may mix the dough in a stand mixer, if desired. Use the dough hook and mix on low speed for 12 to 15 minutes, or until the dough is well developed. Transfer the dough to a lightly floured surface and shape the dough into a round. Place the dough in an oiled bowl, turning it to coat, cover the bowl with plastic wrap, and let rise until doubled in bulk, about 90 minutes. My Czech great-grandmother made prune kolaches so I grew up eating them and these taste the closest to hers. Thank you for this recipe! I could not eat it (long story) but everybody who tried it loved it.